*Manufacturer Rebates subject to residency restrictions. Any customer not meeting the residency restrictions will receive a dealer discount in the same amount of the manufacturers rebate. Only 5 SRT models left in stock! New vehicle pricing includes all offers and incentives. Tax, Title and Tags not included in vehicle prices shown and must be paid by the purchaser. While great effort is made to ensure the accuracy of the information on this site, errors do occur so please verify information with a customer service rep. This is easily done by calling us at (281) 810-9571 or by visiting us at the dealership. Price does not include dealer installed options. ***Manufacturer Rebates subject to residency restrictions. Any customer not meeting the residency restrictions will receive a dealer discount in the same amount of the manufacturers rebate. Price advertised is on stock number KS586582, MSRP 43470, Sale price of: $37470 Dealer Discount $6000 Chrysler Incentives of: $9000 Consisting of:63CK1 SW BC Retail Consumer Cash ($2500), SWCKL SW BC Texas ($3500),SWCKA SW BC ($1750), 45CKC1 Ram BC ($750). Price does not include tax, title, license fees, or dealer installed options. Please see dealer for details. $9,185 off MSRP! 2018 Dodge Durango SRT Wont Last Long, Well Maintained, Nitrogen, Window Tint, Wheel Locks, AWD. Welcome to our new and improved website! 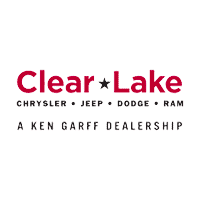 Clear Lake Chrysler Dodge Jeep Ram has been serving the Houston car purchasing community for over 30 years. Our sales staff is handpicked and groomed to give you, the customer, a fantastic buying experience. Our service department is driven to keeping you a “Satisfied Customer for Life.” If you are unable to find the vehicle that best suits your needs, please do not hesitate to contact us immediately. If you are interested in checking out this or any other of our vehicles, please schedule a test drive and come by to see it in person! We’re located in Webster, but we have customers from all over the area including Houston, Pasadena, League City, Sugar Land, Friendswood, Baytown, Deer Park, and more!